Appearance does play a significant role in your success, especially when it comes to your business. Even if you provide the best service or cost on the market, the truth is that potential customers will get a terrible impression once they see the dusty storefront whose corners are covered in mold. They will naturally assume that your service provides the exact same quality standards. The situation is even more severe if you run a medical facility, hair salon or restaurant. 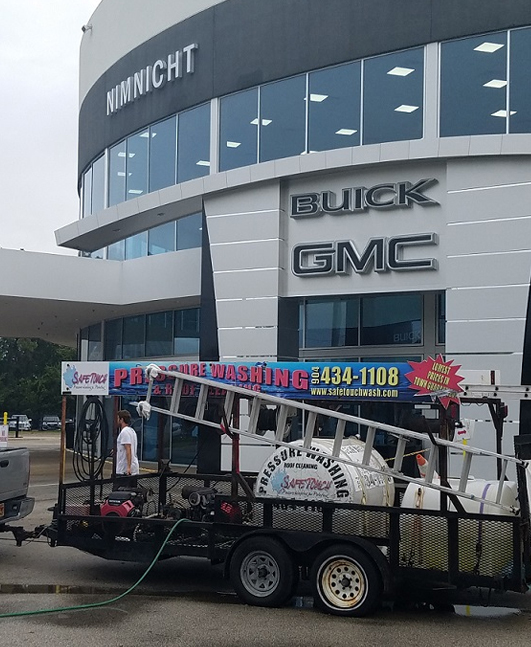 All in all, the good news is that you do have a simple and cost efficient solution to boost your business overnight – our Jacksonville Pressure Cleaning service. cleaning can be in changing the overall design of a building in Jacksonville. Forget about replacing windows or renovating the sidings at every few years. Forget about new signs or walkways at every four or five years. Instead, pressure cleaning will clean the entire place and you enjoy the brand new appearance. Furthermore, we provide roof cleaning Jacksonville, FL as well. Jacksonville Commercial Pressure Cleaning is an amazing improvement if your building exterior is covered in dirt, regardless of its form. Stubborn stains will most likely resist to regular cleaning operations. And even some of the more easy to remove ones will become a hassle without a pressure washer. Try removing tree sap, mold or graffiti yourself and you will realize that it seems impossible. Sidewalks and entrances are most likely covered in chewing gum too. Sometimes, scrubbing it can be a nightmare, especially if you have a large storefront. Grease stains and mold will affect your entryway too. Mold looks easy to remove, but it is actually a pain. You might clear the effect, but the cause will bring it in weeks or even days later. How about the roof? Just because you can hose the roof, it does not mean that it is perfectly clean. Our roof cleaning Jacksonville, FL service will actually climb up there and eliminate algae, mold and hard deposits of dirt. Our pressure cleaning Jacksonville, FL service uses nothing but professional equipment. As for our organic pressure cleaning solutions, some of them cannot even be found in regular stores. The operation is performed with a powerful pressure washing sprayer. Sometimes, water itself is everything you need in order to clean a tough deposit of dirt. In other cases, detergent is needed too. The pressure varies according to the surface. Normally, it goes between 750 and 30,000 psi. This is why it is not indicated to perform such operations on your own. The lack of experience can injure you or damage the surface. In the end, business is just like real life. It does pay off to put the best face you have. If you are in Jacksonville, FL, feel free to schedule a free evaluation of your property and make a decision based on our quote.